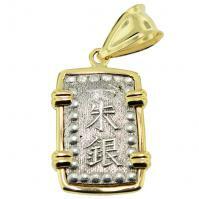 Japanese Shogun 1853-1865, Isshu-Gin in 14k gold pendant. 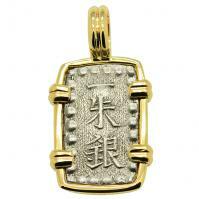 Japanese Shogun 1837-1868, Ichibu-Gin in 14k gold pendant. 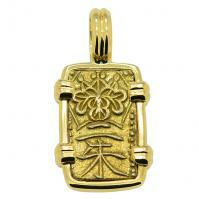 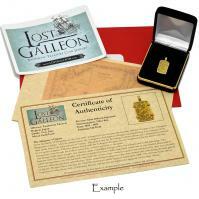 Japanese Shogun 1832-1858, gold Nishu-Kin in 14k gold pendant. 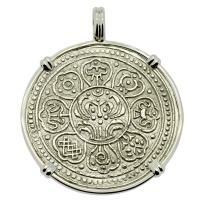 Buddhist Tibetan 1850-1880's, Ga-Den Tanka in 14k white gold pendant. 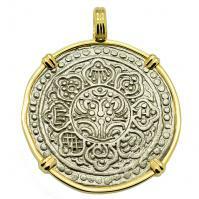 Buddhist Tibetan 1850-1880's, Ga-Den Tanka in 14k gold pendant. 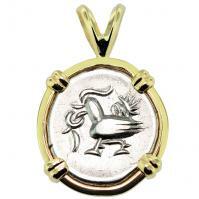 Hindu Cambodian Hamsa Bird 1 Fuang, circa 1847 in 14k gold pendant. 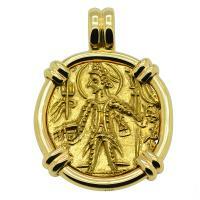 Kushan Empire AD 290-310, gold dinar in 14k gold pendant. 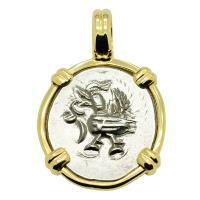 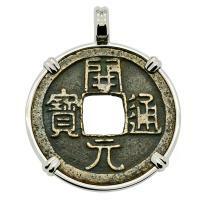 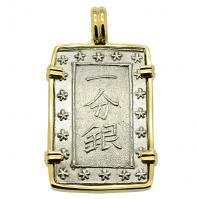 Chinese Tang Dynasty 618-907, bronze cash coin in 14k white gold pendant. Chinese Tang Dynasty 618-907, bronze cash coin in 14k gold pendant. 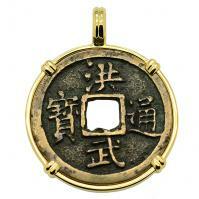 Chinese Song Dynasty 960-1279, bronze cash coin in 14k gold pendant. 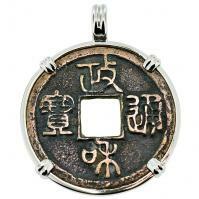 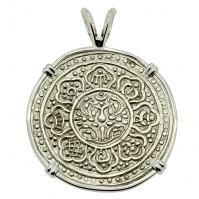 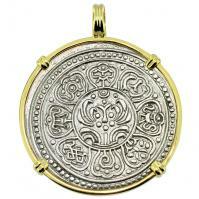 Chinese Song Dynasty 960-1279, bronze cash coin in 14k white gold pendant. 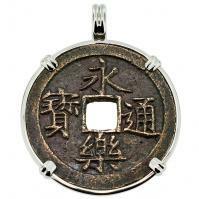 Chinese Ming Dynasty 1368 - 1644, bronze cash coin in 14k white gold pendant. 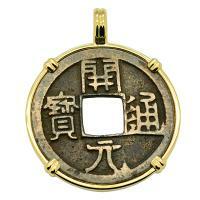 Chinese Ming Dynasty 1368 - 1644, bronze cash coin in 14k gold pendant.